My price depended on the colour of the ship. This one was dark when I first saw them, to pass unnoticed in the outer parts of the solar system. Repairs would be gouges from a mining drill, crushed panels from desperate collisions. Odd damage for a ship too small to mine. Dark ships could afford to pay, as long as I didn’t ask where the trade came from. As the cycles continued, they came back with less damage each time, and richer trade. They went from dark to dark on light. They no longer hid, but displayed their danger. Dusky ships would drop their trade before risking dark on light. Their final trade was a piece of glass. Dusky shine, like honey. I kept it in their memory. I was a dusky ship in my youth. Afraid of dark ships and light ships alike. I didn’t know what to do, but I knew I had to stay hidden. My crew had little direction to offer, as they spent their time turning liquid to honey to more crew. Their bodies middle on light, with delicate shine wings. The time passed as I told them stories of the first crew. They flew in open air, bright sky over flowers, dark and dusky. I was smaller then, with only two eyes. But isolation isn’t forever, even in space. I heard a cry from a dusky ship. My offer to fix them was treated with suspicion at first, and then wonder at the efficiency of the crew. Their mandibles able to repair with a precision people lacked. I asked for less from dusky ships. Only some pigment for my outer, because I was no longer dusky. I was middle on light, like my crew. The only difference was my shine wasn’t on wings. It was all inside, like the shine grown in the ganglia of every crew. A ship has a colour and a reputation. It’s best not to shine on the outside. I remember my three. A mother, dark. A mother, middle light. A parent, dusky pale with shine leg, to replace one lost somehow. All three cared for the crew, but my parent knew the most. They hummed as they checked hives and removed honey, with never a sting. I stood shorter than my three, though I grew taller each rotation. I ran through middle grasses, carrying a shine ribbon in my hand. It fluttered out behind me as I weaved through the hives. The crew had little care, because I judged their trajectory and the flow of the ribbon. I never hit crew or hive. “You’ll be a pilot sometime,” said my middle light mother. “Parent is a speaker, not a pilot.” I said. I was more like my parent than any other. Though I had my dark mother’s eyes and my middle light mother’s face, there were other ways to be like another. Two of the dusky ships had turned light, after they’d combined together. “It’s better this way,” said one of the pilots. She enjoyed moving, so to work with another pilot meant freedom to explore the corridors sometimes. Her counterpart was less impressed about leaving the pilot station, but they did enjoy being able to catch up on their reading. Neither said about the relief of greater strength. That was shown in the lightness, because only a safe ship will show their position so clearly. They offered I could join them if I wanted, so two become three. I declined. Maybe I would find another pilot, once I trusted again. I’d glide through honeycomb corridors with my ribbons flying. For now, I helped them join and took my trade. The ship was all shine. Their lights had lights, so no one would miss their approach. The pilot didn’t bother with introductions, because he felt no need to be polite. He said as much as the ship loomed close to me. A small army of people could fit on the shine ship. Mine only had room for me and my crew. It’s no wonder the shine ship wasn’t afraid, but as my dark mother used to say, you should always be considerate, especially if you’re powerful. “We’re looking for a ship. Blue and yellow stripes. Have you seen it?” Their demand was framed as though answering was optional, but I knew better. I’d often asked my parent where their leg had gone. 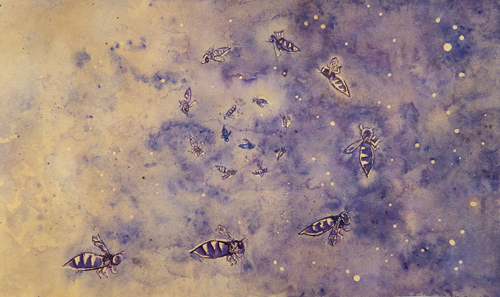 They’d say the crew took it for a hive, a river carried it to the sea, it turned into feather seeds and floated away. But when I was almost as tall, my parent told a different story. There’d been a war, a long time ago. They fought and survived. But war never really leaves. It makes a hive in people until it’s ready to swarm. It was after the war the three were attacked and my parent lost a leg. War was never far away, and large ships with shine and weapons were as likely a place to find it as any. They’d been scanning me and I hadn’t tried to stop them. I was all crew. They could have known that by looking at my colours. They could have heard my crew, if they’d bothered to introduce themselves. They left without ceremony, but I knew it was the last time I’d see the dark on light ship. No one could fight off that much shine. My parent was dark before they were dusky pale. They’d lost their skin to fire, and it never came back the same colour. It could have been worse. Some went light pale, so couldn’t stand the starlight at all. Dusky pale was still safe on a planet. I hoped the ships would be like skin. Surviving, if damaged. But I didn’t hear again from the dark on light ship. I heard warnings to flee from light ship after light ship. I followed the calls, because when a ship didn’t flee, there were no more sounds. No pale survivors. I was neither strong nor fast. Middle on light was too useful to harm. That was enough against dark ships and light ships. It wasn’t enough against the shine. When they returned, all I could do is let them on board and offer them trade. I had honey, wax and numerous components my crew had spent cycles constructing. The shine people passed all of these. They ignored the honeycomb corridors and barely glanced at the honey pods. I’d seen people like this before, on the last cycle of my three. My parent had begged for my life, as I was still a child. But the shine people had a peace to keep. It hardened people to the cry of a child, because in their minds they could say I was almost full grown, and almost is as good as there. My mothers had attacked from behind, giving me time to run to the ship, with the crew streaming after me. No amount of time would make me forget their uniforms. The logo of a forgotten animal swimming in space. The shine people would never be content with a portion of trade. They wanted all of it. They arrived at the pilot station and prised open the lid of the chamber, with enough care not to damage anything. I looked down on my body, pale with pale eyes, where the colours of my three had faded. I looked up at the people with my two eyes. They reached for the shine wires attached to panels on my head. I was trade. Speaker, pilot and fixer, all in one. I spoke my last words to the crew. Matt is the colour of dead crew, once their shine is gone from their wings and their ganglia. Their bodies fell around the shine people, after each delivered a sting. The shine people screamed. This wasn’t how crew were back where the peace was kept. Those crew had their stings removed from their code before they were even eggs. The shine people fled the room, but they wouldn’t make it through the corridors. A body can take only so much poison. I flailed towards my head, trying to reattach my wires. But I’d been in the station too long, and my hands flopped against the side of the chamber. More crew entered the room. A tickle of feet and wings as they explored, figuring out what was damaged and how to fix it. They slid the wires back into place and I was with the crew again. I acted as a big ship, with all my lights showing my position. The shine ship followed my movements. They warned of death penalties for what I’d done, but they still wanted my trade. They wouldn’t destroy me when they were so sure their peace would overpower me. My crew drifted behind me, ribbons of dark bubbles. I spiralled and turned, taking the shine ship across my path again and again. Little dark on shine, so small that no one can see. So small that the weapons ports only had to open a crack. The pilot’s panic was the last message, the moment before my crew opened his chamber. It was a quick transition after that. Many crew ready to honeycomb fresh corridors. One pilot station to another. One coat of pigment. Middle on shine. Every colour has a reputation. My middle was trade and fixer, but I carried my war in my shine. Polenth Blake lives with cockroaches and likes photographing tiny things. Polenth's work has appeared in Nature, Strange Horizons and ChiZine. More can be found at http://www.polenthblake.com.